I love ribs. I love slow smoked ribs. I particularly like a touch of sweet on my slow smoked ribs. So, I fired up my Louisiana Grills Pellet Smoker and made some Maple Glazed Ribs. I started by pulling the silverskin off a large rack of spare ribs with a paper towel. Then I gave the ribs a generous rub of Louisiana Grills Sweet Rib Rub. I preheated my grill to 210 F, put the probe from my Bluetherm Duo remote thermometer in the ribs and put them on the grill. I smoked them for about 5 hours, spraying them with apple juice two or three times. I mixed 125 ml (1/2 cup) maple syrup and 50 ml (1/4 cup) of barbecue sauce. I used my Molasses Mustard Q Sauce but your favourite barbecue sauce will be fine. I smoked the ribs for 30 minutes longer and then let them rest before cutting them into individual ribs. I would like to talk about two things with smoking ribs. First, if you do a long smoke, you may get a layer of reddish colour on the surface of the meat. This is called a smoke ring and is highly sought after by some smokers. It doesn’t add anything to the flavour of the meat and you may not get it depending on the type of smoker you use. The thing about the smoke ring is that some people may think it means the meat is under cooked. Of course the meat is very well cooked over many hours so tell them it is a sign of a great smoke! The other thing about smoked ribs is the texture. If you have ever cooked ribs on a grill without precooking them, the ribs would be quite chewy and wouldn’t pull from the bone. If you boil the ribs first or cook them for a period of time in foil while you are smoking them, the meat will fall off the bone as you eat them. Some people really like their ribs this way. 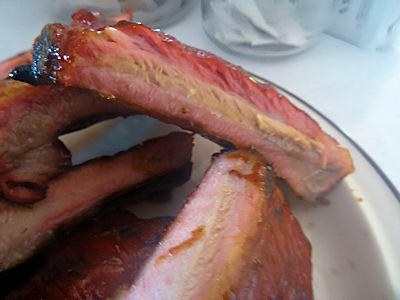 In my opinion, the perfect texture for ribs is when you bite the rib and the meat from your bite comes cleanly from the bone but the rest of the meat stays on the bone, leaving a perfect bite mark. This texture gives you a nice chew but isn’t tough. However, you should make ribs the way you like them. 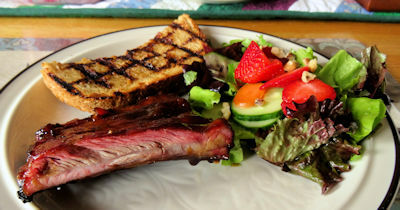 We served our ribs with Mountain Toast (the next post) and a nice fresh salad from our garden. 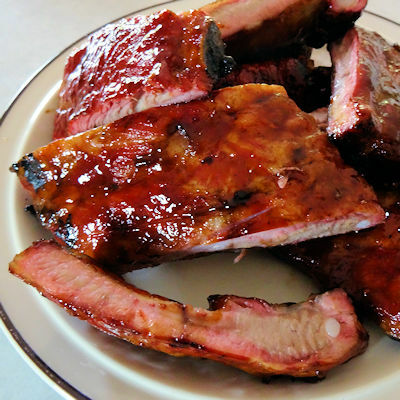 I loved the smooth sweetness that maple syrup gave the ribs and the barbecue sauce and rib rub gave a nice gentle heat. These ribs are worth making again! The maple glazing is just right up my alley! These ribs look absolutely divine! Thank you. They do go well together. Thanks, Jeff! They were tasty.